Take a look at this. It’s a Toyota Sera. You might think it’s a fantasy car that fell out of one of your brain folds. Nope! This is a real car, a car that exists, a car that was sold to you, a member of the public. Well, sort of. 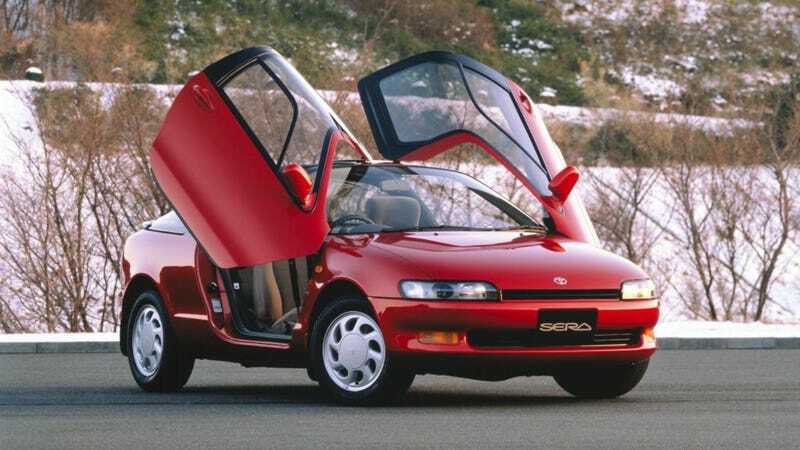 The Toyota Sera was like the Toyota Paseo. Remember the Paseo? Remember teal? Do you remember it? Can you smell what The Rock is cooking? Both the Paseo and the Sera were little sporty coupes with small inline-four cylinder engines and front wheel drive. The Paseo was a jellybean with no distinguishing features. It was Mark Zuckerberg’s face in car form. It was fine. The Sera was much like the Paseo, only it had wing doors of great joy, flapping in wonderment to the deep hum of the universe. We never got it in America, but it was a thing that was to be had by you. Maybe not you personally, but out there there is a you that was a you that could have had bought the Sera, personally, though not the you personally who is reading this, unless the you personally who is reading this is not American. Do not let your dreams be nothing more than dreams. Let your thoughts ride Sera wings, into reality and existence.